An egg roll is an appetizer which was originally eaten in East Asia but has spread throughout the world as a staple of Asian cuisine. Many Asian countries are claimed to have originated the dish, and variants of the egg roll exist in multiple Asian cuisines but Southern China is the most likely source, as it stems from features of Cantonese cuisine. Left: An American-style egg roll, with a view of its interior. An egg roll is made by wrapping a combination of chopped vegetables (often mostly cabbage), meat, and sometimes noodles, in a sheet of dough, dipping the dough in egg or an egg wash, then deep frying it. It can be closed or open ended. When compared with its cousin, the spring roll, the egg roll is generally larger; has a thicker, puffier skin; is crunchier; and has more filling than the spring roll. However, the terms "spring roll" and "egg roll" are often used somewhat interchangeably. The egg roll dough is wheat-based while the spring roll is sometimes rice-based. In mainland China, many Chinese-speaking regions of Asia, and Chinese immigrant communities around the world, egg roll is predominantly referred to as the egg-based, flute-shaped pastry, with typically yellowish, flaky crust often eaten as a sweet snack or dessert commonly eaten by Asians. Some varieties are made with sesame seeds or other flavorings/toppings, such as chocolate, cream, or strawberry. The term may also be used to refer to another modern Asian breakfast cuisine that mixes the western omelet with thin egg roll wrappers. In American Chinese cuisine, egg rolls are called either "Fried Egg Roll" or "Fried Spring Roll"—both terms are used interchangeably. In Britain, "egg roll" also commonly refers to a fried egg in a bread roll (a breakfast item) or chopped, hard-boiled egg with mayonnaise in a bread roll (a party buffet item). 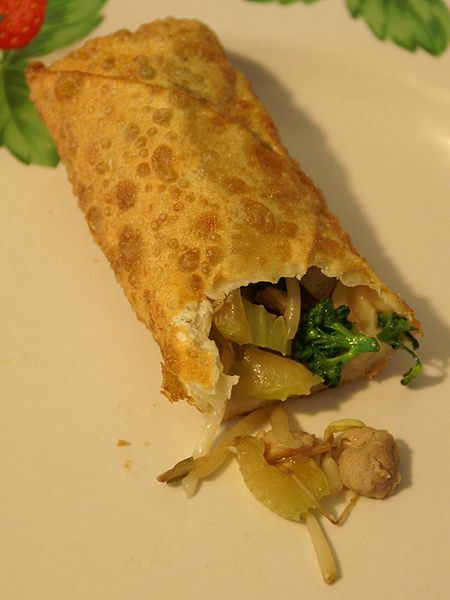 The terms "pancake roll" or "spring roll" are often used by Chinese restaurants in the UK to describe what is called an "egg roll" at Chinese restaurants elsewhere. A "Mexican egg roll" is an egg roll wrap filled with beans, cheese, and, optionally, meat, as well as various peppers and spices. It is then deep-fried and served with sour cream or salsas, like the chimichanga. In Mexico the residents refer to it as a burrito or in some rare cases, a taquito. In the Philippines, the egg roll is called Lumpiang Shanghai but is more popularly referred to as Lumpia. In the United States, several restaurant chains (such as Chili's) market a "Southwest Egg Roll", which is a Tex-Mex dish consisting of a deep-fried flour tortilla containing (among other ingredients) corn, black beans, spinach, chicken, monterey jack cheese, peppers, and other spices.